NOTE: Information on Jeep 2.5L starter not available from manufacturer. Bosch and Mitsubishi use a permanent magnet starter. A planetary gear train transmits power between starter motor and pinion shaft. The starter magnetic field is produced by 6 permanent magnets. The Mitsubishi starter is a 12-volt unit that has the solenoid mounted on the starter housing. See Fig. 3. NOTE: See the TROUBLE SHOOTING - BASIC PROCEDURES article in the GENERAL TROUBLE SHOOTING section. NOTE: Engine should be at operating temperature before performing this test. Heavy duty oil or a tight engine will increase starter draw amperage. Tests are performed with standard volt-ammeter tester. selector to 16-volt position. Select function to 0-500-amp scale. Connect voltmeter leads to corresponding polarity battery terminals. Connect ammeter leads to corresponding battery terminals. switch. Ammeter should indicate starter draw of about 150-220 amps. to battery terminal on starter. to battery cable connector on engine block. to starter solenoid lead to the field coils. fails to crank, starter is defective. does not crank go to next step. continuity between solenoid and field coil terminals. solenoid. Reconnect field coil wire to field coil terminal. is shorted, blade will vibrate and be attracted to core. Replace shorted armature. Using a self-powered test light and touch one lead to armature shaft and other lead to each commutator bar. See Fig. light glows, armature is grounded and should be replaced. Using a self-powered test light and touch one probe to series field coil lead and other probe to field frame. If light glows, replace field coil housing assembly. While holding clutch housing, rotate pinion. 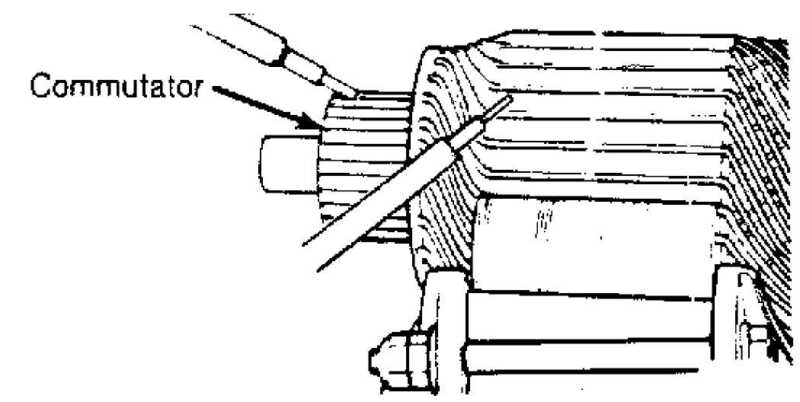 Drive pinion should rotate smoothly in one direction only (should not rotate in opposite direction). 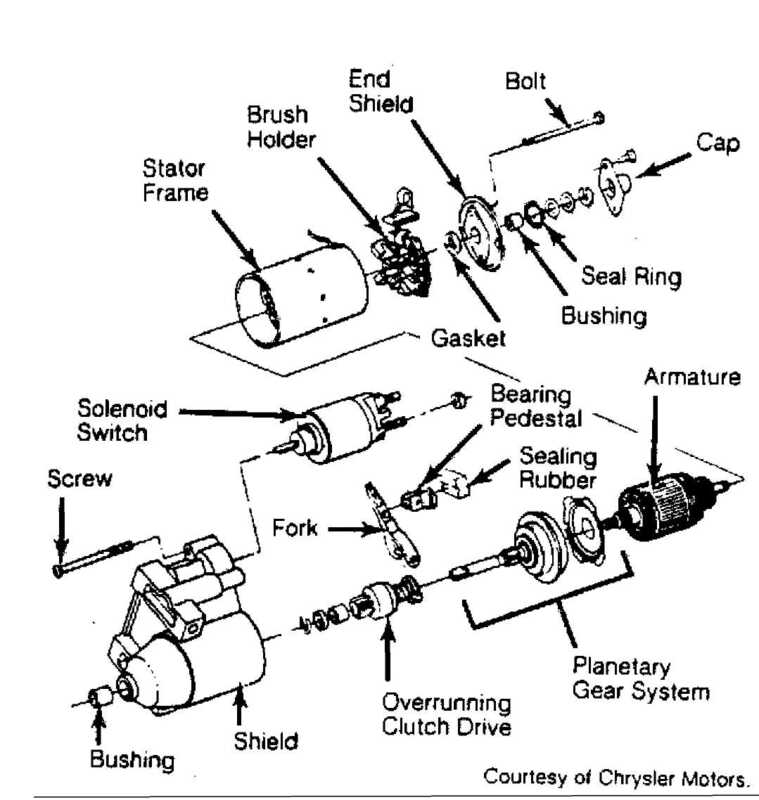 If drive unit does not operate properly, or if pinion is worn or burred, replace drive unit. (1) - New brushes are 11/16" (17.5 mm) long.